Uchuu Sentai Kyuranger - Decisive Battle! Don Almage Reveals His True Form! After the former king and father of Lucky, Aslan, willingly sacrificed himself to destroy the Jark Matter's planet, Don Almage finally reveals his true form and prepares for the final confrontation with the Kyurangers! Check-out these latest magazine scans featuring the final battle between the Kyurangers and the leader of the Jark Matter Organization! 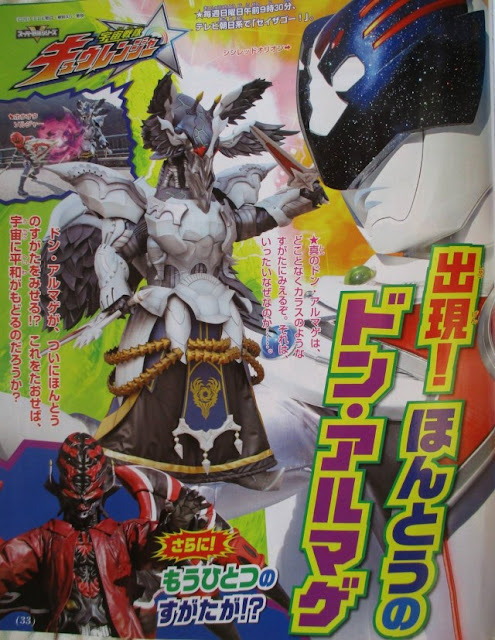 In the next episode of Uchuu Sentai Kyuranger, the ultimate saviors will use all the power-ups that they have acquired throughout their adventures to even up the odds! 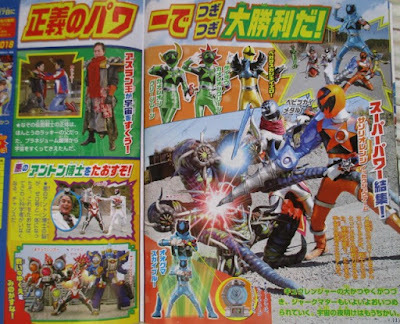 And it looks like Prof. Anton will fuse with a Champ Zero to become Anton Zero! Finally, Don Almage will unleash his fury in 2 forms! One form is based on the Phoenix Soldier while the other one is a crow form! Is this his way in getting his revenge against Tsurugi by adding insult to injury? This is it! The moment that we have been waiting for! The final battle against the Kyurangers and Don Almage ignites and the fate of the universe in the hands of the ultimate saviors! 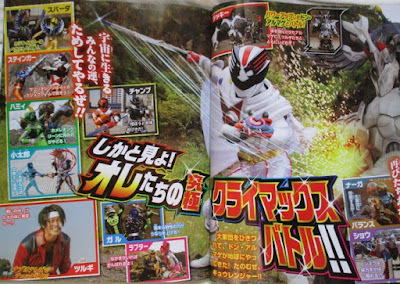 Come on, what happened to the adult-styled Ooguma suit that was leaked toward the beginning? Was it scrapped for giant Koguma? 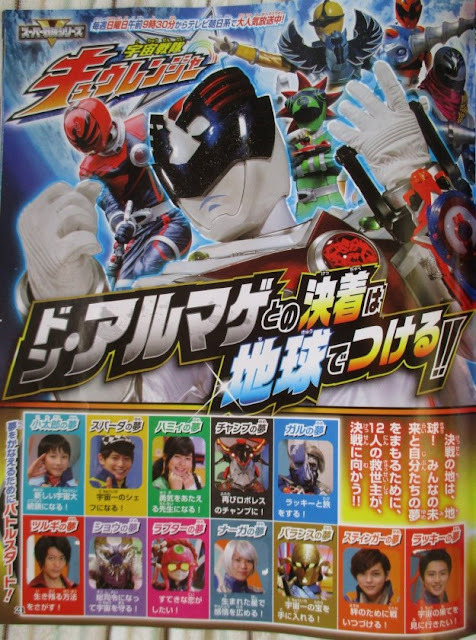 Wheres this years vs. Sentai series? Or rather I should say next years. Don Armage true form looks awful, especially the mask. It looks like they took several concepts and couldn't decide which one, so they mashed them together. To add insult to injury it looks like they draped one costume over the already stiff cumbersome Don Armage costume. His other form's design is completely irredeemable, basically being a lousy repaint with a red leather jacket draped over it. The previous season's big bad Lord Ginis had a great design being colored gold and silver, having a giant throne attached to his lower body, having a translucent humanoid-esque face, and an overall crystalline aesthetic. These choices made him come off as a cruel yet regal and godlike being who watched lower lifeforms suffer for his amusement, as he figuratively and literally towered over everyone.